Another product I developed during the build of my S4K and V8Q. Both the large and small chassis Audi's suffer from horrible understeer due to their inherently nose heavy layout. One way to mitigate this design flaw is to increase castor. Increasing castor causes the car to become more chassis neutral and allows the use of less static camber due to increased active camber gain under compression. Back in the day Audi ran between 7 and 9* oc castor on their tarmac race cars. This product is designed to allow you to replicate these numbers. I run 7* of castor in my RS4K track car and the chassis is now very neutral. 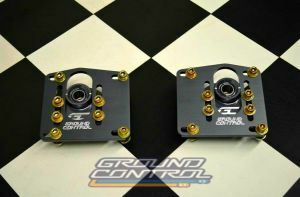 The kit is designed to utilize the ground Control universal 4 bolt camber plate system, however to provide increased adjustability in both castor and camber I developed a replacement mount plate for that setup. The kit consists of a pair of weld in tubes and top plates that replace the factory strut top and the custom aluminum mount plate for the GC setup. Significant fabrication is required to do the install but it is well within the capabilities of most of us here. I can provide the kit as shown, or with the top plates welded to the tubes and finished, however this is an additional cost. Again there are several people installing these over this winter build period and I will get feedback from them in the spring when they have had a chance to dial them in and test them out. Horrible picture I will improve later, this pic also shows the steering arms and gusset plates. I have been running these for over a year or two? They work great. I have run these in a couple of projects too. They work very well. Dumb question: would these replace the use of a heavy duty version of the traditional strut top mount (ala Rusty/K24R @ s2forum, or VAP/ManceMounts)? Asking because I'm lined up to be a beta tester for the K24R mounts but they're super pricy (about 500 quid) and who knows when they're going to be available, and we all know about the VAP situation. TIA, input from the OGs is always appreciated. Sent you an email HT. So Haydn, are you buying the spherical portion from GC to use with your aluminum top plates? I assume these are designed to work under the weld in section to keep the plates in compression? I like the idea of ditching the OEM Fail Mounts and since ProMounts are on pending NLA I may as well consider these. Would you be open to a version that could work with the KW style top mount? The Ground Control plate has a similar mechanism, Ed. It's actually a pretty clever design. The upper spring perch rides against a needle bearing. That needle bearing in turn rides against a large greased ball/socket interface. Rotation of the spring (for steering) is handled by the needle bearing, changes in angle (due to suspension motion, etc.) are handled by the ball/socket. The strut shaft goes through the middle of this whole deal, and is located by a spherical bearing that ends up only handling the damping loads of the strut in compression and rebound. All of the body force loads through the spring, bumpstop, etc. go through the perch->needle bearing->socket, so everything is properly supported and the spherical doesn't get beat up. Mcstiff wrote: I like the idea of ditching the OEM Fail Mounts and since ProMounts are on pending NLA I may as well consider these. 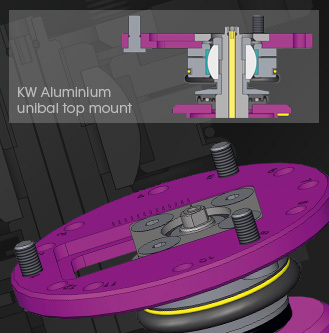 I could make a modified version for the KW strut tops if there is demand. personally I like the GC units as the design is really nice. Mcstiff wrote: How's the weather sealing? Pretty much non existent LOL, which is the case with any use of a spherical bearing on a race car. The spherical bearing is really the only part that could get grit in it and wear out, and those are user replaceable. It would probably be pretty simple to make a rubber boot to go up inside the strut tower to seal it from road grime. Hank wrote: So Haydn, are you buying the spherical portion from GC to use with your aluminum top plates? I assume these are designed to work under the weld in section to keep the plates in compression? yes the design is setup to be underside mounted so the loads are restrained by the weld in strut top not on top where it is all on the bolts. hence the failure mode is a lot safer. yes the Idea is that the entire GC camber plate kit is used, but the aluminum plate is replaced with mine to give a greater range of adjustment. The reason I am not reselling the GC stuff, and asking people to buy direct is that there are many options for strut type and spring diameter. Only a partially dumb question, or alternatively "There are no stupid questions, only stupid answers"
Yes these replace the entire strut top mount and the OEM or upgraded OEM mounts cannot be used. Extra suspension travel due to raising the height of the strut mount is one of the many reasons these towers/plates are beneficial. these look awesome...hows hood clearance on a UrS? I'm heavily considering these for the future. Even with the fabrication it's better than a 2bennet setup. Wonder how much work it would be putting these into a T44 compared to a small chassis car. pilihp2 wrote: I'm heavily considering these for the future. Even with the fabrication it's better than a 2bennet setup. Wonder how much work it would be putting these into a T44 compared to a small chassis car. I have a set of these in my V8Q long term on hold project, install is very similar to the small chassis cars but is a little easier as the strut tower does not interact with the mid firewall. Other than the tubes, what's the difference? Similar, as you said the tube is additional and makes for a cleaner install. Also I created a replacement install Al plate for the GC unit that gives more adjustment. So for the GC strut mounts, the koni shock is about 3mm smaller in diameter than the hole in the spring perch. Is suspect this adds to the noise because the top perch can pivot and let the spring deflect from the centerline. I am thinking about adding a spacer like so to try and quite down some clunking I can't seem to get rid of.